Overview - From celebrated director Rob Reiner (The Bucket List) and Oscar®-winning screenwriter William Goldman (Butch Cassidy and the Sundance Kid) comes "an enchanting fantasy" (Time) filled with adventure, romance and plenty of "good-hearted fun" (Roger Ebert). Featuring a spectacular cast that includes Robin Wright (Forrest Gump), Cary Elwes (No Strings Attached), Mandy Patinkin (Homeland) and Billy Crystal (Tooth Fairy), this wonderful fairy tale about a Princess named Buttercup and her beloved is "a real dream of a movie" (People). Tales, yarns, chronicles, legends, myths, anecdotes, parables, fables, narratives. Whatever you choose to call them, stories and storytelling have been around since man could… well, since man could. It’s just in us. Simple as that, rooted deeply in our DNA. It’s a necessity, a natural and essential function, like breathing or eating. It’s primal. We need to do it. We need to tell stories by firelight. We need to splatter paint on cave walls. We need to look at the world with eyes full of wonder and possibility. We need voices in the dark. Sometimes we need them to explain, to excite, to inform, to teach, to entertain, to inspire, to enlighten, or in some cases to merely fill the silence. In Rob Reiner's 1987 classic, 'The Princess Bride,' the story in question is told for one very specific purpose, and that so seemingly uncomplicated, pure, and honest motive -- as so beautifully expressed by Mandy Patinkin in the included special features -- is for a Grandfather to tell his Grandson, that the most important thing in life… is true love. This tiny morsel of truth sets off a grand adventure, spinning a yarn full of fairy tale magic, storybook charm, and laugh-out-loud wit, cementing this beloved film as a timeless classic for all ages. 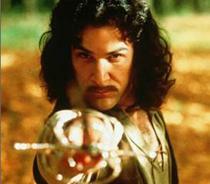 MGM brings 'The Princess Bride: 25th Anniversary Edition' to Blu-ray on a single BD-50 disc housed in a keepcase. The movie was previously released in a Blu-ray/DVD Combo Pack, and outside of one new special feature and the exclusion of the DVD copy, this disc is essentially identical to the previous one (it even has the same menus). After some logos and warnings the disc transitions to a standard menu. The packaging indicates that the release is Region A coded. The movie is presented in a 1080p/AVC MPEG-4 transfer in the 1.85:1 aspect ratio. This appears to be the same exact master and encode from the previous release, and the film continues to look rather lovely. The source is clean and a light, natural layer of grain is visible throughout. A few shots exhibit a very slight smeary quality which may indicate some extremely minor processing, but it's never distracting, and the movie as a whole has a pleasing film-like appearance. Detail can be very strong and many scenes feature a good level of depth and dimensionality. Colors are beautifully vibrant without being unnatural, and the many wide shots of lush, English countryside simply pop off of the screen. Contrast is strong and black levels are deep and inky. There really isn't much to complain about with this video presentation. Though some scenes are definitely more impressive than others, and the film's lower budget roots do shine through (a lot of effects work is much more noticeable thanks to the added level of detail), this a very fine transfer for a very fine film. 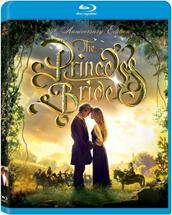 'The Princess Bride' is provided with an English DTS-HD Master Audio 5.1 track as well as a Spanish Mono track and a French Dolby Digital 2.0 track. Subtitle options include English SDH and Spanish. Like the video, this appears to be the same mix from the previous disc, and it remains a very solid track. Dialogue is nice and crisp delivering all of the memorable lines with clarity and precision. Directionality between the front soundstage is good but rear activity is a little subdued, with only some minor ambient effects and music cues. Dynamic range is respectable but not terribly wide, and bass response is fine though it never really stands out. Balance between all of the audio elements is good, and thankfully nothing gets lost in the shuffle. It may not hold up to contemporary surround sound tracks, but the mix here is certainly respectful of the source material and is more than adequate at serving the film. MGM has ported over all of the previous disc's supplements and has included one brand new two-part retrospective featurette for the movie's 25th anniversary. All of the previous special features are presented in standard definition with Dolby Digital 2.0 audio and no subtitle options (unless noted otherwise). The new featurette is presented in 1080p. 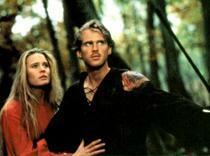 'The Princess Bride' is a simple yarn about true love, one that rises toward classic status thanks to some witty dialogue, intelligent scripting, passionate direction, and unforgettable characters. This is a film that works for all ages and plays just as fresh today as it did when first released twenty five years ago. This new Blu-ray features the same strong video, solid audio, and healthy assortment of supplements from the previous release, but forgoes the DVD copy. The brand new retrospective featurette is a decent addition but doesn't really offer fans much that they haven't already heard before. If you don't already own the previous Blu-ray and don't care about a DVD copy, this is certainly the release to get. If you already own the previous disc, however, then spending the cash to double dip on this release is sadly… inconceivable!